Warmwell Caravan Park in Crossways, Dorset, offers a range of caravans and static caravans for sale. 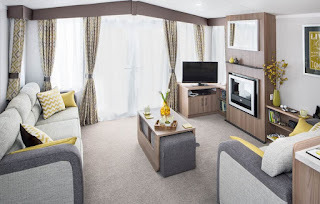 All of the caravan holiday homes are double glazed, have central heating and are tastefully furnished, making them the perfect holiday home. The 2017 Atlas Chorus static caravan is a fantastic choice for holiday home buyers. This model has a grey colour scheme running throughout and is finished with vibrant soft furnishings that pull this contemporary look together. Excellent facilities include an integrated oven with grill, integrated fridge/freezer, 4 ring hob & electric ignition, L shape lounge seating & en suite WC to master bedroom in the two bedroom model. The 2017 Swift Bordeaux 2 bedroom static caravan is also available. The u-shaped kitchen offers plenty of worktop space and soft close on all of the modern kitchen units. You'll have everything you could need appliance wise too, with a glass fronted oven, grill, 4 burner gas hob and overhead cooker hood. There is also a double door integrated fridge freezer and space for a microwave oven. The Bordeaux comes as either a two or three bedroom holiday home and in a choice of two sizes in each. For those who wish to explore the Dorset countryside and beaches, or just to relax on the site, Warmwell Caravan Park in Dorset is the perfect choice.